EMS's Alumina Powders are accurately controlled for all specs and particle size distribution, assuring you the best polishing results. The following micron sizes are available: 0.05, 0.3, and 1.0. Type DX Alumina Powder is specially treated to reduce the number of agglomerates (group of particles in each grade of manufactured alumina). The result is fast polishing and improved quality of the finished products. Type N Alumina Powder is recommended when these improvements are not necessary. Dark gray 98% SiC. Hardness, Moh's scale 9.0; Knoop Scale 2500. Crystallography: hexagonal – alpha and beta phase. Boron Carbide is one of the hardest materials known, ranking third behind diamond and cubic boron nitride. Due to the hardness, boron carbide powder is used as an abrasive in polishing and lapping applications. These are abrasive powders that are prepared from aluminum oxide, offering excellent coarse and intermediate polishing, with fast results. These suspensions are water-based and contain no additives, which may interfere with polishing or contaminate the sample. All slurries are very stable and alumina is evenly dispersed. Excellent for the finest finishes. As an acidic dispersion, Colloidal Alumina is a chemical-mechanical action, that provides superior surfaces on germanium, silicon, gallium arsenide, zinc sulphide, fluorides, sapphire, ferrite's and silicon carbide. Low scatter finishes can be obtained on pure metals such as nickel, tungsten, copper, beryllium, steel and aluminum. Epoxy resin materials and plastics have also been successfully polished with this versatile colloidal dispersion. 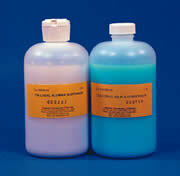 Properties: pH: 3-3.5; Solids: 20%; Viscosity: thixotropic. Application: Depending upon the application, Colloidal Alumina can be used full strength or diluted. Dilution up to 1:1 or higher with deionized water is recommended. Polyurethane and short nap cloths are recommended. However, most commonly used laps and pads are compatible with colloidal alumina. This non-crystallizing Colloidal Silica is made to be user friendly. It eliminates the problems that are caused by drying or freezing that are associated with other colloidal silica products which are used for chemical/mechanical polishing. Colloidal silica is a first choice silica dispersion for optimizing polishing results such as silicon, fused quartz, fused silica, lithium niobate, YAZ, GGG, alexandrite, sapphire and many others. Application: Colloidal silica can be used full strength or diluted. Dilution to 1:1 or higher with deionized water is recommended. Polyurethane and short nap cloths can be used. With great experience, technical knowledge, and modern facilities, we are able to manufacture superior diamond compounds and provide reliable service to every one. Glennel® diamond products are specially formulated to help you prepare surfaces that are usually difficult to polish and require precision finish. To satisfy today's demand the diamond compounds must be complex with near perfect tolerances as is ours. MONOCRYSTALLINE diamonds provide a cost effective means for good stock removal and finish. The natural form has a blocky shape with a smooth surface. Synthetic diamonds have a slightly irregular shape with multiple edges. Precision grading and high quality standards guarantee consistent shape and size. This consistency and unique shape make this a popular diamond for many production-lapping applications. POLYCRYSTALLINE diamonds are recommended for microscopy, materialography, and where surface finish is extremely critical. We use the highest quality polycrystalline diamonds, Dupont Mypolex(r). It has a uniform blocky shape with a rough surface. Precision microfractures built into each particle provide uniform and consistent fracturing under stress. Glennel® UB Formulation is excellent for most applications where a diamond compound is desired. It is soluble in either water or oil and works with all common extenders. UB compound is recommended for polishing laboratory specimens and lapping of materials such as carbide, ceramic, sapphire, composites, ferrite, and silicon. Glennel® UC Formulation is an oil soluble compound recommended for finishing wire dies, molds, cold heading dies, and general shop applications where diamond compounds are required. UC provides fast cutting action and superior finish. Meant to be used with our Formula C extender for maximum efficiency. Glennel® OS Formulation is an oil soluble compound designed for lapping large areas of hard material. Use alone or with an extender it cleans up easily, provides aggressive stock removal and an outstanding finish. All Diamond Pastes are available as a standard in 5 g size dispensing tube UB or UC and UBS or UCS. 18 g sizes are available upon request. Glennel® Diamond Suspension assures a consistent, uniform viscosity and dispersion of diamond without any shaking or stirring. The proprietary formulation guarantees that the particles will stay suspended indefinitely. It is ideal for automatic polishers and applications that require changing operators. Compatible with all common extenders. All Diamond Suspensions are packed in 400g bottles and have Medium Concentration prepared with Premium Polycrystalline Diamond in either Propylene Glycol (Oil based) or Water based formulas. Glennel® Diamond Aerosol Spray provides unsurpassed cutting action and finish. The inverted nozzle provides safe and easy access for difficult to reach areas while ensuring that every diamond particle is used. Special formulations allow the carrier to evaporate quickly, leaving a very uniform dispersion of diamond. This is especially useful when an operation requires a dry polishing cloth. Our Diamond Spray is available in 5 oz cans. Glenoil Lube – Lapping vehicle is the ideal lap oil for all Glennel® UB Compounds and Diamond Sprays. It assures continued separation of diamond particles and constant removal of lap debris. Formula C is made especially for oil soluble compounds, such as Glennel® UC and US listed above. This penetrating formula is specially designed to enhance cutting action and leave a superior finish. 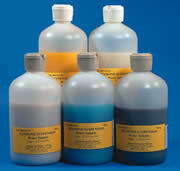 Formula B is a universal lapping vehicle, compatible with both water and oil soluble compounds. It is ideal in an environment where materials change constantly. This very versatile formulation allows you to change materials and compounds and still provides excellent lubricity and cutting action.